Use our budget calculator to calculate an estimate of how much your website will cost. Follow the prompts below and complete all sections. What are you trying to achieve through your website? How much will your website cost? Use our budget calculator to calculate an estimate of how much your website will cost. Follow the prompts below and complete all sections. Your Purpose... What are you trying to achieve through your website? Not getting enough leads? A well designed website can help your business achieve more leads through the use of excellent usability strategies. Want to sell your products and services online? Having an effective and optimised shopping cart system can make all the difference! Your website will need to be uploaded on the web. We offer reliable web hosting with support. Content/Copy of a website can break or make the success of a website. Choose your words carefully! Having social media accounts will give you the platform to talk with your customers. What webpages would you like? Please let us know the pages. Fill in your details below to receive a copy of your estimated budget in your inbox. Your Details... Fill in your details below to receive a copy of your estimated budget in your inbox. Please find your estimated budget below. This is a rough estimation of how much you will need to build your website. Your Details... Please find your estimated budget below. This is a rough estimation of how much you will need to build your website. Your website may be eligible to be on a payment plan! What is the capital of QLD? Complete the form below. We look forward to the opportunity of working with you. Trick the SPAM Bots! Tell us what is the capital of QLD? “I’m thinking about buying one of your products, but I have a few questions.” This is how a general conversation begins on a physical shop floor, a conversation we are still very familiar with, even in the digital age. However, the average consumer is now more likely to be online, which means a salesperson misses the chance to look the customer in the eye. The consumer also has very different expectations where speed plays a critical role. In this type of environment, chatbots play an important part in the entire sales process, supporting existing sellers and contributing to your staff numbers. Fortunately, setting up a chatbot is far from a difficult process, although there is still a window for ‘interviewing’ your future bot when sifting through the various products offered by app developers. Small or large, any company can implement a chatbot on their website with very little effort. Once a chatbot has been installed, potential customers are able to have a natural conversation with smart software before making the decision to buy. From a sales perspective, there are several good reasons to ‘hire’ a chatbot. Although professional, human sales staff are still necessary, chatbots offer numerous benefits that help with much more than sales or signups. Speed is critical. Every online visitor has become accustomed to a quicker-than-quick online service. If your company fails to live up to their expectations, you are guaranteed less sales and signups than your speedier competitors. If your website takes longer than average to load, you may lose the opportunity to find yourself a new customer, and the time is long gone when the consumer sent an email and was prepared to wait a few days for an answer. Everything a customer order can be delivered within twenty-four hours, every sector competitor is offering some or other deal or discount, and every potential customer is spoiled for choice. Not only that, he or she expects rapid service well in advance of any purchase and has probably built up an opinion about your product, having read reviews and listened to others’ points of view. When a customer comes to you, that customer is on the cusp of a purchase. If you make them wait, they will opt for your competition. If you cannot answer their questions, they will find out the answer from sources you have no control over. Chatbots never sleep and don’t take a break. They are always ready for every customer, whatever part of the globe they live in. And you give them the information they, in turn, give to your customers. They don’t mind repeating their answers, they can be taught to word things in a simpler language when necessary, and they can mimic human staff to a degree. Chatbots are definitely not one-trick ponies. According to how they are implemented they can also play a very useful role along the purchasing process pathway. A chatbot can detect which phase your potential customer is in and offer the right content for that particular milestone. This means they can gently steer your customer towards an actual sale. They will even deal with aftersales, although it is not recommended to use your chatbot to bombard people with automated surveys and push notifications. When your customers return, your bot will recognise them and can be programmed to treat them in the same way as an often-visited salesperson. This gives your existing customer a higher sense of worth within your company, especially when offered discounts that reward their loyalty, birthday deals, and products that they have previously expressed an interest in. Your chatbot can give them smart content in response to earlier purchases or queries. Customer satisfaction levels and experiences can also be recorded, stored and retrieved. Satisfaction surveys post-purchase are very rarely filled in, but a chatbot can enquire about UX in a more subtle manner, collecting precise and detailed customer feedback along the way. Imagine a chain of web stores dealing in home décor that is looking to start up a new label for the under-thirties market. Young people tend to be more critical and well-informed as customers; they are more used to the online experience and more likely to ask specific and in-depth questions about the product they are planning to buy. In the mentioned example, all the home décor web stores should implement group conversation, where a chatbot is an additional channel assisted by a physical member of the sales staff. This would also apply to more complicated products where in-depth online information is limited in an attempt to simplify readability or because of a large catalogue of rapidly changing products. Your goal is to retrieve detailed information for the customer as rapidly as possible, and this goal can be attained through a chatbot or a combination of chatbot and human sales staff. This means a company’s level of customer service will increase. In addition to customer service and sales, a chatbot can also collect leads. You might want to list items or information already proven to be of interest of your customers and in this way develop a list that makes the lead follow-up process simpler. A chatbot may cost money to implement, but its worth in leads more than makes up for the costs. Lead follow-up processes can even be automated, such as through using push notifications on social media platforms. Amtrak’s chatbot is a great example. Not only does this bot deal with millions of traveller questions, it also links a conversation to further services. If a visitor is looking at a trip between New York and Charleston, it knows that the distance makes this less of a day trip and will mention the possibilities of booking hotels. It can put forward taxi firms which take passengers to New York train stations, offer a free guide to Charleston as a destination, or offer to arrange car hire at the destination. It will remember earlier booked trip or pricing or date queries and build up a pattern of customer behaviour that can contribute towards further analyses. What is more, chatbots can assist in every industry, from e-commerce to travel and finance. They are often responsible for credit applications and money transfers; however, group conversation should be implemented in credit applications due to negative feedback concerning chatbots when loans have been declined because of minor reasons a human loan officer would be less likely to take into account. When compared to physical staff, chatbots are cheap but certainly not free. These costs are quickly recouped, and there is no need to pay a developer to set up a chatbot as this is usually a very simple process. Updating information is a similarly easy procedure. A chatbot will also bring all company sales process expenditure to light, allowing you to analyse exactly where your sales process works best or needs adjustment. A quality chatbot will also record which questions it is unable to answer, print all dialogue, and make sure every step is measured and every statistic stored. In other words, even the more expensive chatbots will make up your investment within an extremely short space of time and serve as an additional channel for analysis. Can I get rid of my sales staff? 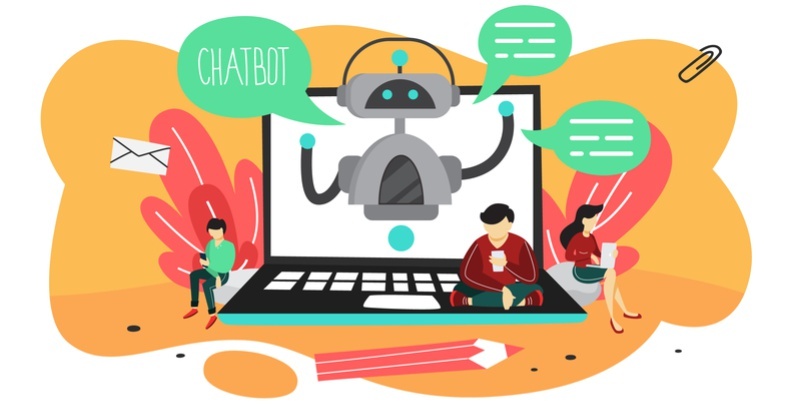 In the future – in fact, within just a few short years – chatbots will be much more prominent in the sales process and a complete self-service channel. The answering of pretty much any question will be automated. Voicebots will also take major steps forward, as will Bot-as-a-Service (BaaS). In the far future, your sales staff may almost entirely consist of smart chatbots. Yet current technology fails on empathy and other human traits. The human side of customer services and sales remains important. Chatbots are unable to deal sympathetically with more sensitive subjects; they have no empathy and they rarely budge from their opinion. Even in self-learning processes, the human aspect is, on the whole, lost. The next generations will be more forgiving than todays, but all aspects of customer service should always include a human face. It is also important to understand that good sales staff are necessary in order to create good sales chatbots; after all, humans are ultimately responsible for how a bot responds. Our computers are still only as good as the human brains that create them. Current chatbot use rarely replaces staff, but do allow a company to deploy human staff members much more effectively. It is not yet the time to replace a flesh and blood sales department, but it is definitely time to add a digital sales staff member.